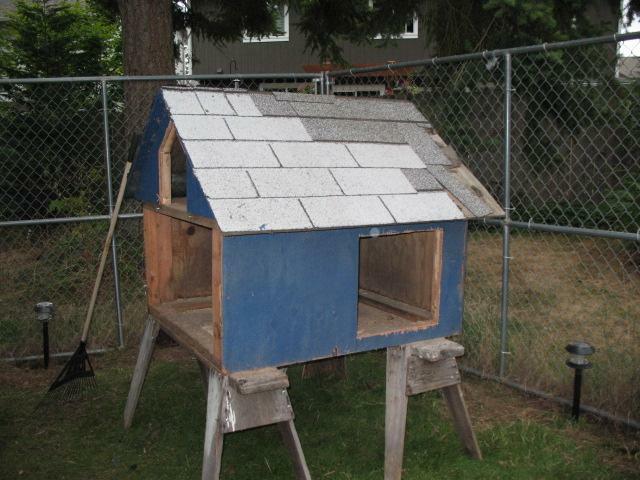 This dog house was originally made using pallets and plywood + shingles from a neighbors shed tear down. 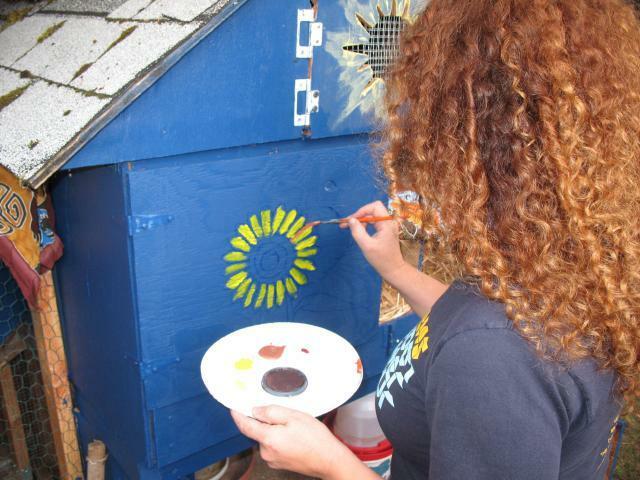 Now 10 years later it is repurposed as the hen house. Side door for poop cleanup, had to hand saw the 2x4 out of my way for easy sweeping! "poop door"! Contruction of Base: lumber - "found around the house" 2 - 4x4's, 3 - 2x4's. 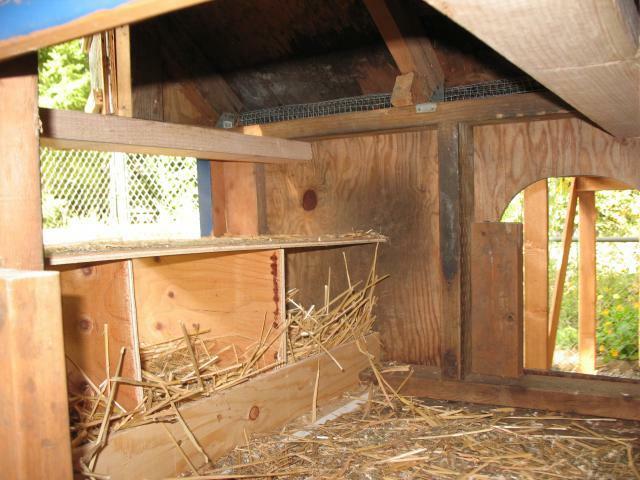 The dog house is 39"x43"(x41"at roof peak), so the base is the same h/w, 30" high to allow room for food/chickens underneath. 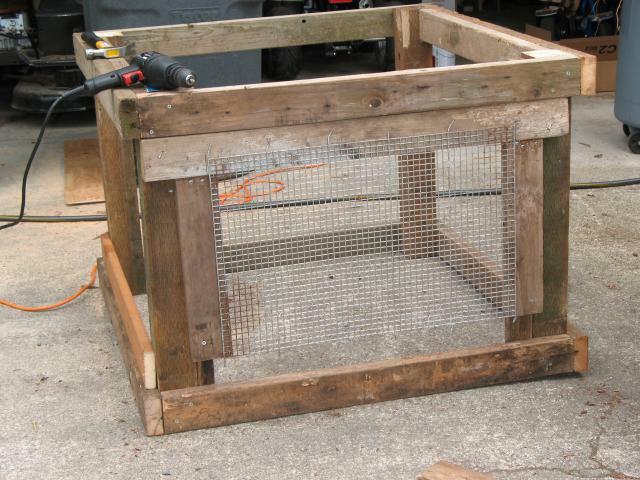 For 3 sides we used pieces of an old rabbit hutch/cage and hardware cloth. Doors are scrap plywood. 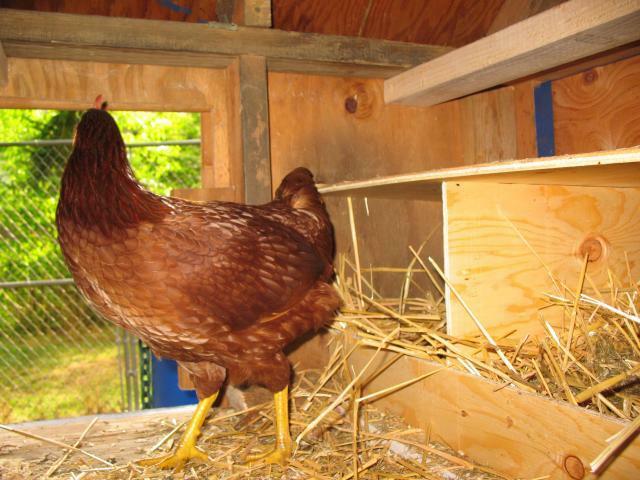 Chicken access door + 2 roosts at same level (had to go through a little trial and error to get them roosting correctly), 3 nest boxes. Ventilation, but no draft comes from open eves with hardware cloth for predator proofing. 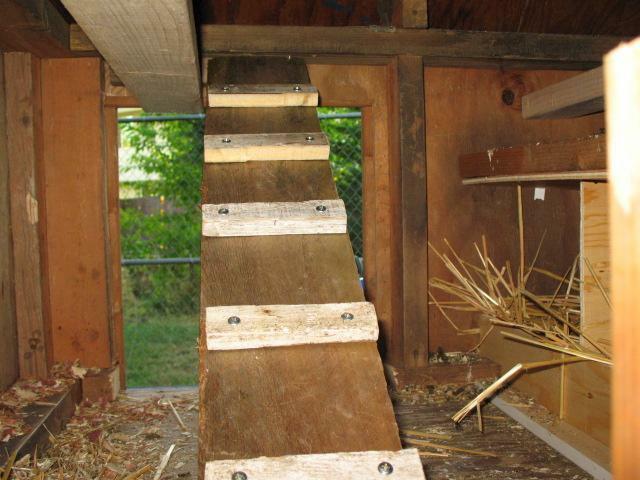 More roost trial and error, we added the ladder - made out of a fence board - so that they would have easier access to both 2x4 roosts. It's a total of 13" / bird - PLENTY, if they use both. Having the perfect layout in such a small space is really important. Girls have to have a little art for inspiration! Plywood for nest boxes and doors = about 1 sheet (left over from a skate ramp project). Total Cost = About $55 - $20 hardware; $25 roll of hardware cloth; A little paint; Bud Lite with Lime! I'm going to insulate the roof with some solar cloth and weather strip the doors as well as finding an option to control how much ventilation/eve area is open. I'm from Alaska but I'm sorry, Seattle winters are COLDER! Sideways rain and the difference between dry and wet climate... Chills me to the bone, so I want to make sure the girls are cozy! 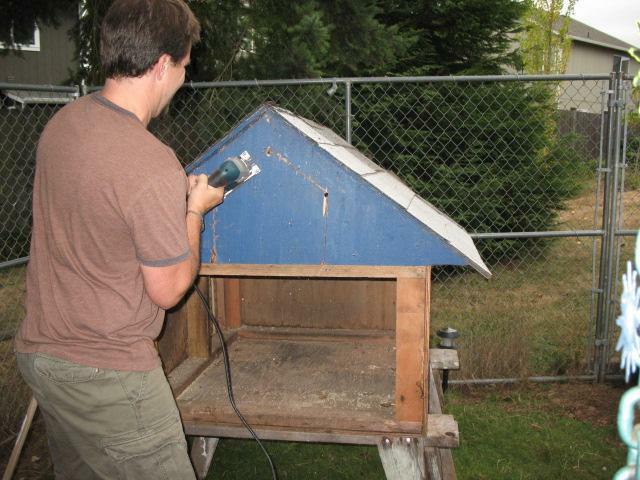 Also have a heat/light lamp I need to install up in peak of roof, that's one reason why I chose the dog house as the most heat efficient unit for them, the lamp will be above their head room so they wont be bumping into it. I wouldn't add the heat lamp, and would add more ventilation. To me the smaller the more ventilation is needed. I didn't even know this was still on here - it was 7 years ago... 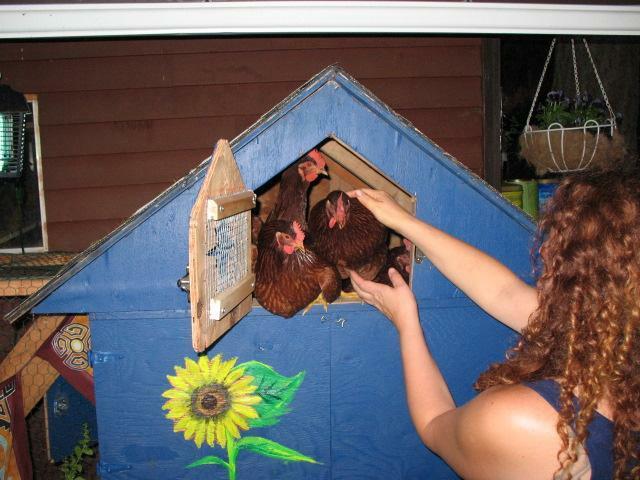 It's been expanded to a full size chicken house now. 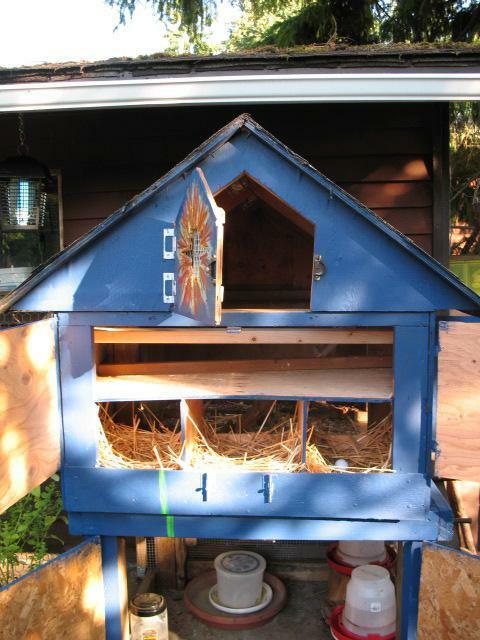 But in terms of ventilation I actually miss this little coop, it had plenty of ventilation - the entire length of both sides under the roof (eves) plus the attic door and the entry door from the run. It was very open. 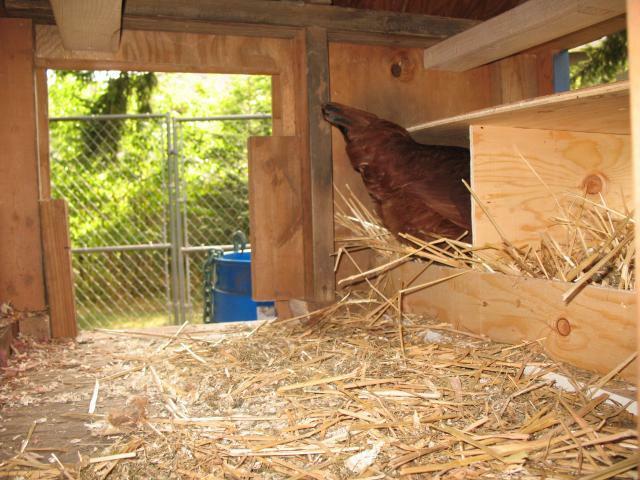 My big fancy coop made from mostly antique windows has less ventilation and it's a concern. I did install a heat lamp but not overhead - it was embedded in the side door. I only used it a few times when temps got really low. 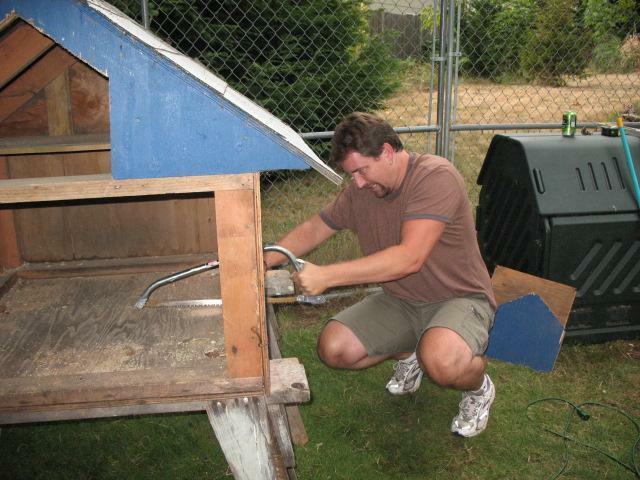 I'd for sure do this same coop again, it was very practical and though the big coop I have now is great because I can walk in it, something seems lost from the simplicity of the dog house. Hope I didn't sound defensive, just not agreeing with you on the ventilation, and those girls were always healthy. Cheers. Good article; plenty of pics. 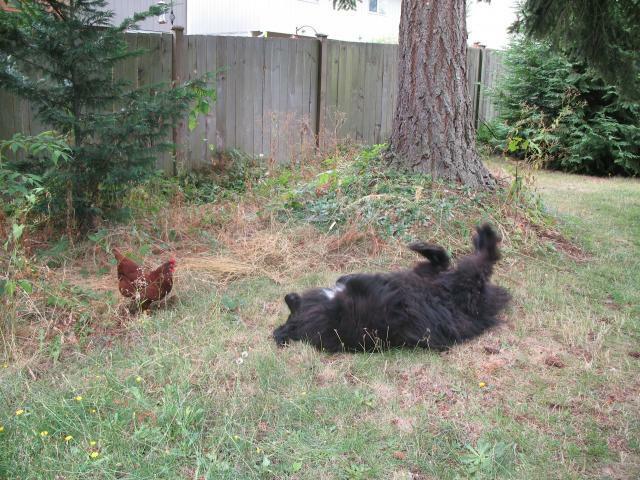 Coop is OK sized for the few hens they have. Points for artistic creativity! I will post another picture soon to show you what I did (and didn't do). I didnt insulate the roof. 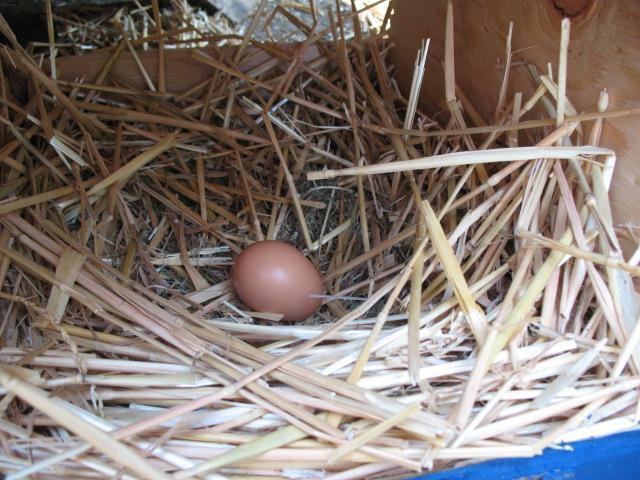 After we installed a heat lamp in the side door, it was warm enough and no need for insulation. We only turn the heat on for the super cold winter nights which = about 20. We put hardware cloth around the lamp bulb - protruding a few inches from it so that if chickens bump into it, not so hot as the bulb. Thanks for the compliments! We've been so happy with this house for a few years now. Love that color of blue. You artwork is beautiful too! 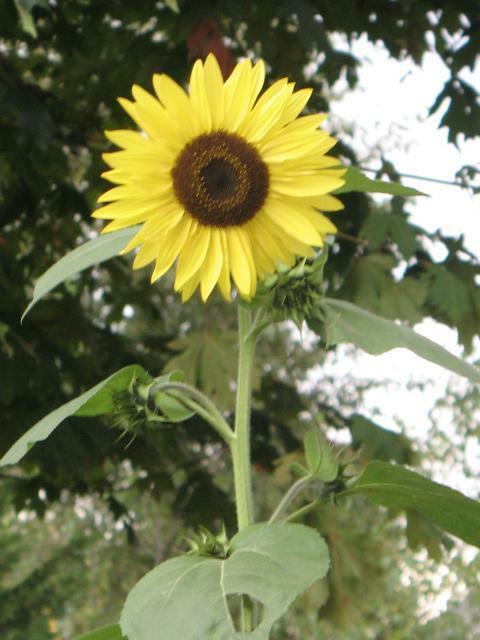 What does the solar cloth do? 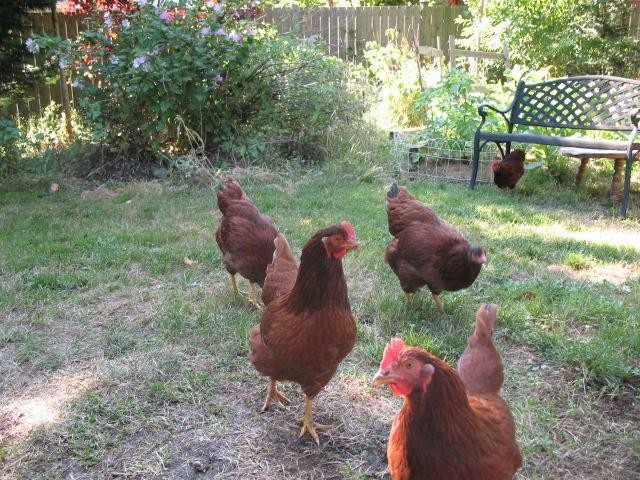 Is your coop insulated. 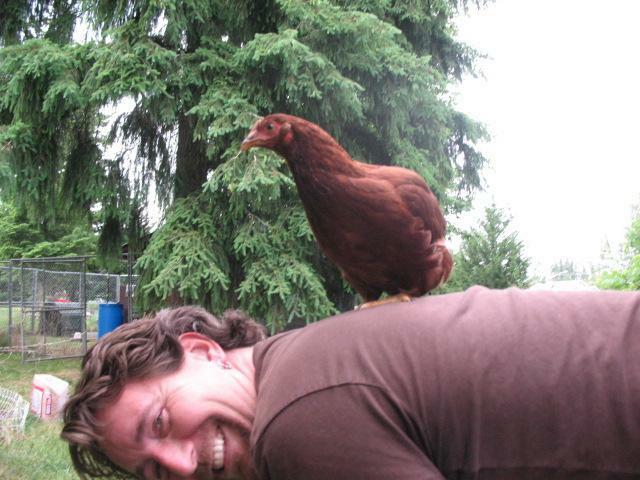 I am from Minnesota and this will be my chickens' first winter. I am worried. Any pointers would be appreciated. 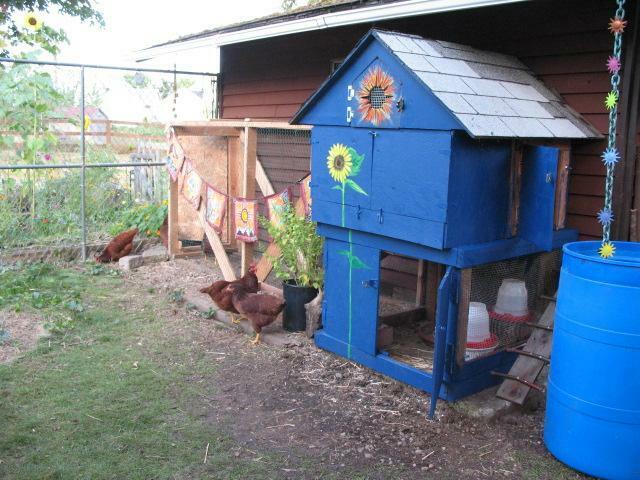 Your sunflowers are better than mine, but I got inspiration from your coop and painted my chicken tractor blue and painted sunflowers on the sides of it. thanks for the inspiration!